Origin and Habitat: Garden origin (Nursery produced hybrid). 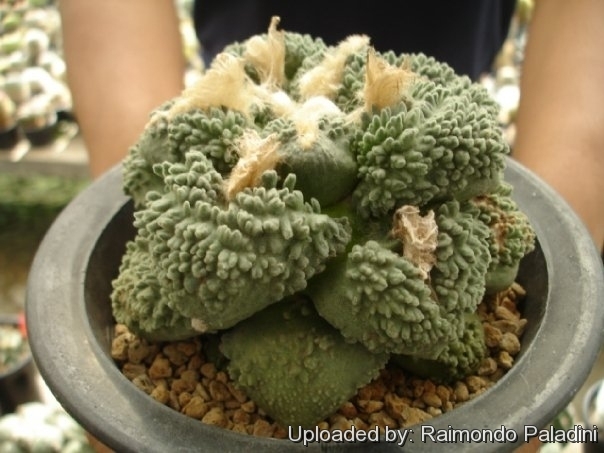 Description: This is a slow growing cactus obtained by crossing ♀ Ariocarpus retusus cv. Cauliflower x ♂ Ariocarpus fissuratus cv. Godzilla. The superb features of this rare plant are due to the intersection between the traits of the ancestors. 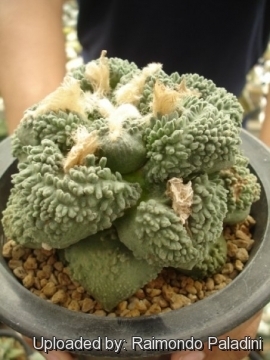 It has inherited by Ariocarpus retusus cv. Cauliflower the huge warty triangular grey-green tubercles and by Ariocarpus fissuratus cv. Godzilla the strongly structured surface. This hybrid is very variable and differences among specimens may be considerable. Cultivation and Propagation: It is not too difficult in a greenhouse, although grows extremely slowly. The plants need deep pots to accommodate the napiform unit formed by the stem base and the rootstock (or they will often simply crack your pots), and a loose mineral soil with a well-drained substrate. They need a good amount of light. Watering can be done weekly during summertime, if the weather is sunny enough, with a little fertilizer added. Kept this way, plants will show a healthy, although slow growth. Propagation: By seeds, remembering that seedlings dislike strong light and dry conditions and need to be repotted frequently. Eventually, as they become mature, they attain a maximum size of 20 to 25 cm. But plants are often grafted to accelerate growth as they would generally take at least a decade to reach maturity on their own, but the grafted plants are typical rather tall growing, compared with plants on their own roots that are usually more flat to the ground. It starts blooming at the age of 8-12 years.